Ravi Coltrane – Yellow Cat – Spirit Fiction (2012) from his latest album with trumpeter Ralph Alessi, pianist Geri Allen, bassist James Genus, and drummer Eric Harland. This is an Alessi composition from an album regarded as his best to date. 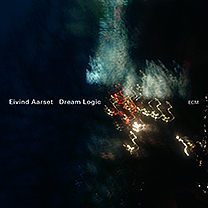 Eivind Aarset & Jan Bang – Homage to Greene – Dream Logic (2012) – The renowned Norwegian guitarist – who has previously contributed to ECM recordings with Nils Petter Molvær, Marilyn Mazur, Arve Henriksen, Andy Sheppard, Arild Andersen and Jon Hassell – with a first ‘leader’ disc for the label, recorded in Kristiansand and Oslo. “Dream Logic” is aptly named, its slowly developing drifting pieces, built up from layers of guitars, have an almost hallucinatory quality, an otherworldly ambience. Jan Bang, who is co-composer of a number of the pieces, also contributes sounds and samples, and co-produced the disc. Matthew Shipp – World of Blue Glass – Equilibrium (2003) – groundbreaking jazz from Shipp in the Thirsty Ear Blue Series together with bassist William Parker, drummer Gerald Cleaver, vibraphonist Khan Jamal, and electronics and programming from FLAM. Marc Copland – Greensleeves – Haunted Heart and Other Ballads (2001) – a stunning album from Copland together with Drew Gress on bass, and Jochen Rueckert on drums…..an excellent recording on the Hat Art Lable. Me’Shell Ndegéocello – Young, Gifted and Black – Pour Une Âme Souveraine: A Dedication to Nina Simone (2012) from the latest album and featuring Cody Chestnutt – those of you who are old enough will recall the Bob & Marcia version which got to number five in the charts in 1970. The album is a great tribute to Nina but surprisingly only has a handful of Simone tunes – concentrating more on the covers. Miles Davis – Black Satin/The Theme – In Concert Live At Philharmonic Hall (1972) – Miles bringing the “On The Corner” sessions to the live stage in the middle of his electric period. Percussion dominates! Myra Melford – A White Flower Grows In The Quietness – Above Blue (1999) Melford called this line-up “The Same River Twice” – it features Dave Douglas, Chris Speed, Michael Sarin and Erik Friedlander and comes from the artier end of the jazz spectrum – unique and different. Lars Danielsson – Mélange Bleu – Mélange Bleu (2006) – featuring Bugge Wesseltoft and Nils Petter Molvaer – rich ambient jazz from Sweden. Isotope 217 – Kryptonite Smokes The Red Line – The Unstable Molecule (1997) one of Rob Mazurek’s numerous Chicago jazz side projects, which produces music somewhere between post-rock and jazz. Isotope grew out of weekly jam sessions around the Chicago area and members of Tortoise – Dan Bitney, John Herndon, and Jeff Parker – bring a modernist angle to Mazurek’s jazz themes.